This lithograph was taken from plate 18 of 'General Views of Lucknow' by Sir DS Dodgson. In May 1857, Indian sepoys (soldiers) from the British Indian army mutinied at Meerut cantonment in North India. This triggered a year-long uprising against the British, which seriously threatened their rule in India. The siege of Lucknow was a key episode of the conflict, and the garrison at the Residency came under tremendous pressure from rebel forces. 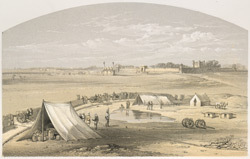 In November 1857, British troops under Sir Colin Campbell arrived at Alam Bagh and from there advanced to the Lucknow Residency, providing relief to the beleaguered garrison. Removed from the more built-up areas and narrow streets of Lucknow, Alam Bagh was an important post from the British perspective. Originally a leafy glade, it is now a dilapidated enclosure containing the grave of General Havelock, who died on 24 November 1857 due to overwork and dysentery, soon after evacuation by Campbell's troops.